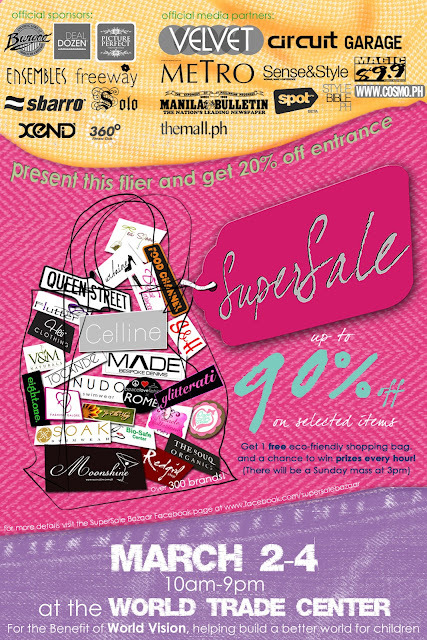 Summer Kickoff at the Supersale Bazaar! While the calendar year officially starts with January, there's something about March that feels like an exciting new beginning. In addition to ushering the feeling of beach season coming, March also serves as a host month to officially welcome the summer—our favorite fashion season. In honor of turning over a new sartorial leaf, the SuperSale Team has become fixated in rounding up your favorite online brands as well as local designers for a 3-day trunk show, all under one tent. Local and imported brands have been handpicked to showcase their latest beat-the-heat ensembles and last year’s collections for this year’s first summer sale event. ***If you want to be included in the guestlist just comment below! Just follow @Supersalebazaar on twitter and tweet this, "@Paxieness is giving away free passes to the @Supersalebazaar, the biggest summer sale event of the year! #SuperSaleMarch2012" Promo runs until tonight! P.S. Will ship prizes of giveaway winners today. Sorry for the delay! I want to be included in the guestlist! can i have two tickets? me and for my bestfriend?? i wish to go there pa nman with may 3 friends..